A trending video shows the moment a food service worker at Comerica Park in Detroit spat on pizza intended for customers. The video has since gone viral on the internet, and the employee fired and arrested. The incident happened on Friday, September 21, 2018, when Detroit Tigers hosted the Kansas City Royals. 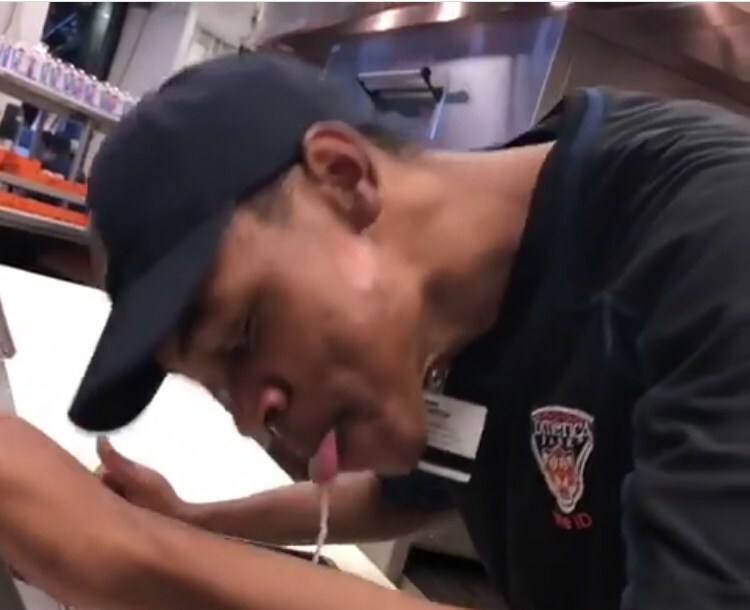 The video posted to Instagram by another employee shows a food service worker at Comerica Park in Detroit spitting on the pizza, then rubbing the sauce in it. I was sent home early today because I didn’t have on my Comerica Park shirt and they say I was at the bathroom for too long. So they yelled at me and told me to go home. The customers don’t deserve this!! This is disgusting! And for the company to threaten me and let me go for exposing this video to the fans is also disgusting!!? Quinelle May said the worker who spat in the food was “mad and having a bad day” and also claimed to have done it in the past. May said after he recorded the video, he went to the bathroom looking around to tell people about the video, but couldn’t find anybody. He said his managers got mad at him and shut him down when they tried to tell them. Officials say the employee is in police custody and could face charges. As soon as we became aware through social media of potential food tampering Friday night, we immediately closed that food stand and disposed of all the product. Food safety is our top priority and we will take any appropriate action necessary to protect our guests. The employee who filmed and posted the video was sent home from the game Friday evening on an unrelated uniform violation prior to us learning about the food tampering via the video being posted on social media. Our only subsequent communication with that employee was to let him know that he would not be working Saturday or Sunday. No one acting in an official work capacity asked him to remove the video. We referred information regarding the video to the Detroit Police Department and they have told us it is an active investigation. Watch the disgusting video below.